Delicias Del Triunfo is a varied line of delicious Mexican candy. Triunfo-Mex, Inc. (Triunfo) was founded in 1993. Its main goal was to become the leading manufacturer and distributor of Mexican candy in the ever growing Hispanic market all over the U.S.A and they did. Triunfo sells quality products at reasonable prices and carries over 850 different types of confections, sundries, food, health/beauty care, and grocery products in its inventory. Triunfo-Mex, Inc. specializes in sales, distribution, service and management of Hispanic Products and has a wide variety of high quality Mexican Candy and Snacks. Without a doubt the most recent addition from the brand Delicias Del Triunfo to the Mexican market won�t go unnoticed: la Ollita Dorada con sabor a Tamarindo (Golden Clay Jar with Tamarind Flavor), a soft candy, pulp style. This new product reproduces a little clay jar, that includes a plastic spoon. Ollita Dorada is a kosher product and its also available in Mango flavor. 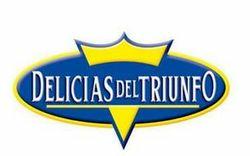 They make excellent candy ideas for children�s parties, pi�ata fillers, and party favors, or if you want to have a delicious snack, Delicias Del Triunfo has just want you need to satisfy your sweet tooth. Triunfo-Mex products includes tamarind and fruit flavored hard candy, lollipops, sour fruit powder, as well as fruit rolls in all fruit flavors and assorted hard candy.